From today onwards we’ll be showing you updates from the construction of Albania’s national arena, or Arena Kombëtare, in Tirana. Currently works are still in foundation stage and run largely below future field’s level, which means the tastiest bits are coming our way in 2017 and 2018. Thanks to the Albanian FA we can share them with you. There are reasons for celebration as construction of Albania’s national stadium has been a long-delayed dream. Neither the government, nor the FA were able to make it come true. After several failed attempts to build a new national stadium in Tirana, after three design changes, after long 6 years of efforts, finally in May 2016 the very last game at outdated Stadiumi Qemal Stafa took place. The following month demolition began and by September groundbreaking of its successor was possible. 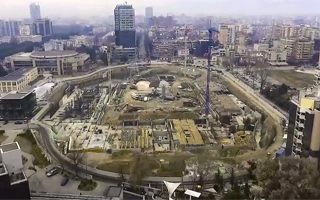 Construction timeframe foresees two years for completion as one of Albania’s largest contractors, Albstar, is on the job. Up to €60 million will be spent on the project, largely financed by private investor who will benefit from non-sporting parts of the development. Only €10 million is spent by the Albanian FA (or, rather, by UEFA’s aid to the Albanian FA). Just like the historical one, new national stadium was designed by architectural team from Italian city of Florence, this time led by Marco Casamonti. A reminder of the predecessor, old main entrance, will be kept and incorporated into the main stand, hidden behind glass wall. There’s no room for running track any more as capacity will grow to over 22,000 seats, all covered. Add to that a 100-meter tower, 80-room hotel and 256 underground parking spaces, and you get the idea why no space for athletics was made in this versatile football stadium. All of the facilities will be hidden behind unique set of blinders in national colours of Albania.